Dollar for dollar, what's the best new car in the world? Opinions vary widely, but if you got 10 professional auto reviewers together -- people who test-drive new cars for a living -- I bet at least seven or eight of them would name BMW's widely-acclaimed 3 Series. And for good reason: It's a stylish, comfortable, practical sedan that drives like a sports car and is built well enough to last a long time. In its segment (which we might call "entry-level luxury sedans"), the 3 Series is the undisputed global king, both in sales and in reputation. Mercedes-Benz, Audi, Lexus... they've all tried, but none have managed to dethrone the king. So why does General Motors (GM), of all companies, think it has a chance? That question was on a lot of people's minds when GM pulled the wraps off its new Cadillac ATS at the North American International Auto Show in Detroit earlier this week. Sure, the ATS looks like an attractive, well-detailed luxury sedan. It's got great lines with well-done touches of chrome, and the interior looks Cadillac-lush and well made. (That's important: Interiors are something GM had trouble with for a while.) And the ATS is smallish without being small -- it's almost exactly the same size, in every dimension, as the BMW, something that is surely no coincidence. But does General Motors -- General Motors! -- really think it can compete with BMW? It's certainly making a serious attempt. GM's PR and marketing folks have been touting the new car's extensive testing on Germany's Nurburgring, one of the most challenging racetracks in the world. The ATS has a sophisticated BMW-like "five-link" rear suspension design, a first for GM, and its engineers have emphasized their careful attention to the car's weight distribution and driving dynamics. It won't lack for power, either, with three engine choices, including a new two-liter turbo four-banger that puts out 270 horsepower -- better than BMW's equivalent -- while giving over 30 miles per gallon fuel efficiency on the highway. Simply put, the ATS manages to look stylish and luxurious while hitting all of the car-geek hot buttons that matter when you're trying to compete with the almighty BMW. And I'm willing to bet that when the reviewers finally get their hands on the ATS, they'll declare that it handles quite well -- a lot like the BMW, in fact. What Makes This Car a Cadillac? Think about this: When Ford (F) unveiled its stylish new Fusion sedan on Monday, it became clear that the Blue Oval wasn't just trying to "compete" with Toyota (TM), whose Camry rules that particular class of cars. Plain and simple, Ford was aiming to blow the Camry out of the water, to leapfrog it, to make it look like yesterday's news. And they did it with a car that is clearly a Ford, not an imitation Toyota. 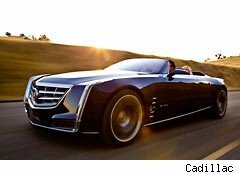 When GM showed its daring, opulent Cadillac Ciel concept last summer, it wasn't just aiming to "compete" with the big, expensive cars that top the product ranges at Mercedes-Benz and BMW. It was aiming to set a new standard. The Ciel isn't a me-too wannabe-German car, it's a Cadillac, grand and imposing and lavish, the kind of Cadillac we haven't seen in ages, right down to its (yes, really) discreet little tailfins. The Ciel is a very modern-looking car, and it likely represents the future direction of the brand -- long-term. But as modern as it is, a time-traveling car enthusiast could arrive today from 1962, take one look at the Ciel, and know instantly that he was looking at a Cadillac. There's no mistaking its identity. But what would our time-traveler say about the ATS? It's got German-style proportions, German-style handling, German-style engines, and it's styled to look a lot like its bigger-brother CTS, just as BMW and Audi and Mercedes make their small sedans look like their larger entries. It's probably going to turn out to be a fine car. But what makes it a Cadillac? BMW knows what makes the 3 Series a BMW. But until GM knows what makes the ATS a Cadillac, and bakes that into the product, its new little sedan could have a hard road ahead. At the time of publication, Motley Fool contributor John Rosevear owned shares of General Motors and Ford -- and a Cadillac. The Motley Fool owns shares of Ford Motor. Motley Fool newsletter services have recommended buying shares of General Motors and Ford Motor, as well as creating a synthetic long position in Ford Motor.